It can be easy to forget that an alien world lives right beneath us – the mysterious ecosystem of the deep ocean of which we've explored less than 0.05 per cent. 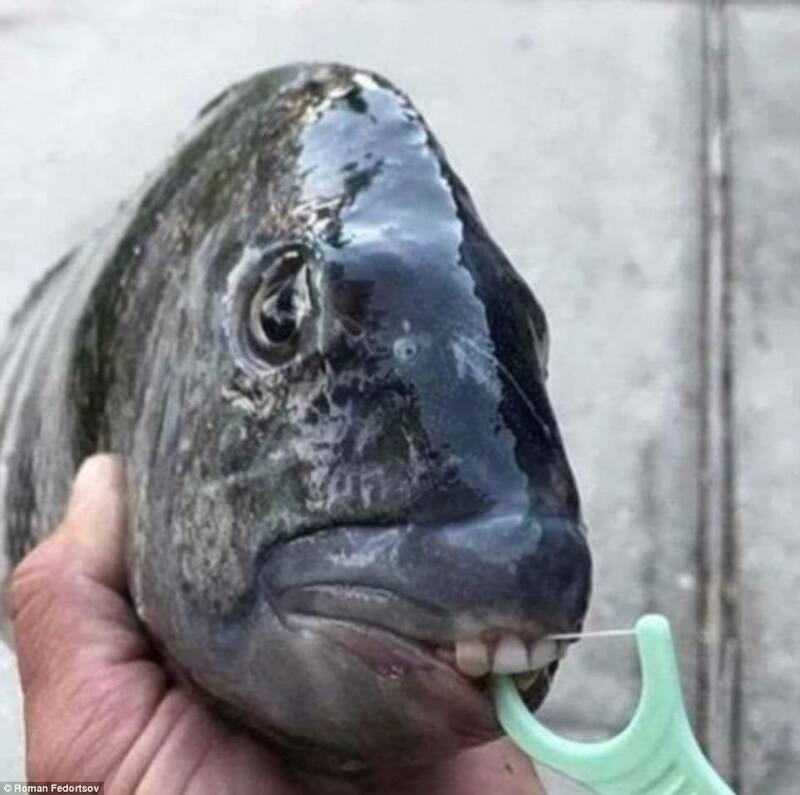 Here, creatures of your nightmares lurk far below the surface and these creepy images could make you think twice before dipping your toes at the beach again. 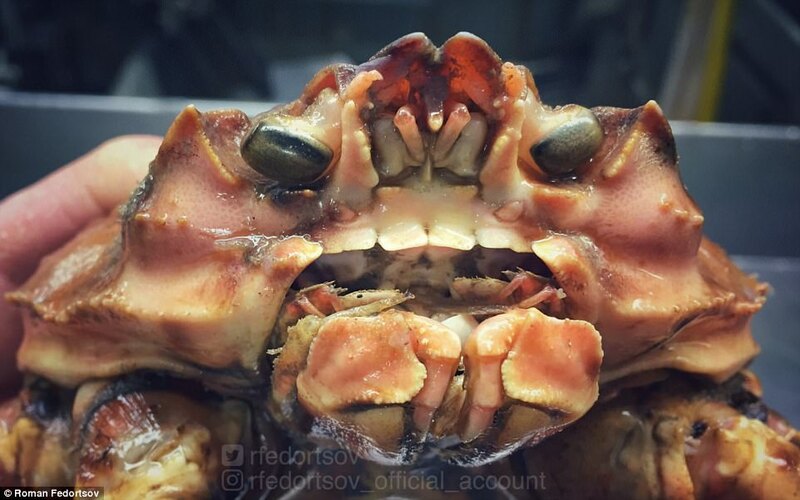 The Twitter feed of Murmansk-based fisherman Roman Fedortsov has revealed a trove of terrifying catches, from eight-legged arthropods to fish with human-like teeth. 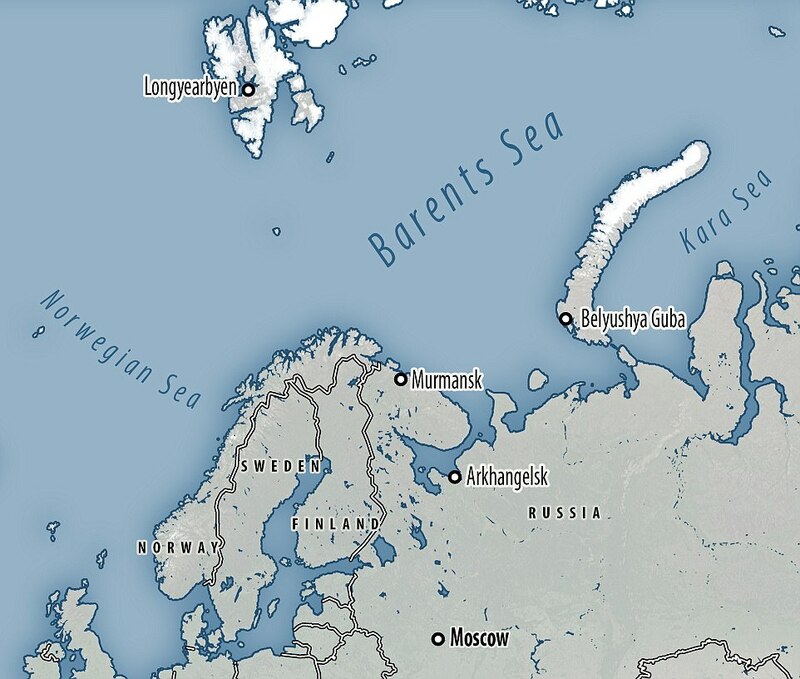 Mr Fedortsov fishes in the Barents Sea - a shallow sea that opens onto the Arctic Ocean. 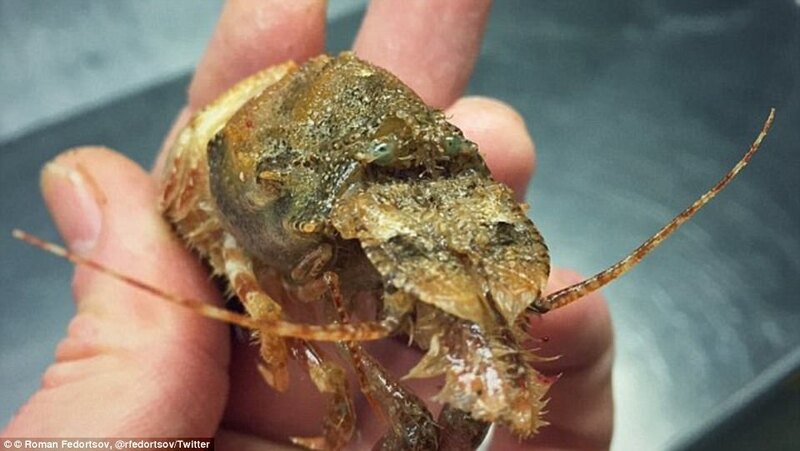 These incredible creatures live in the 'twilight zone' of the ocean, writes Science Alert. 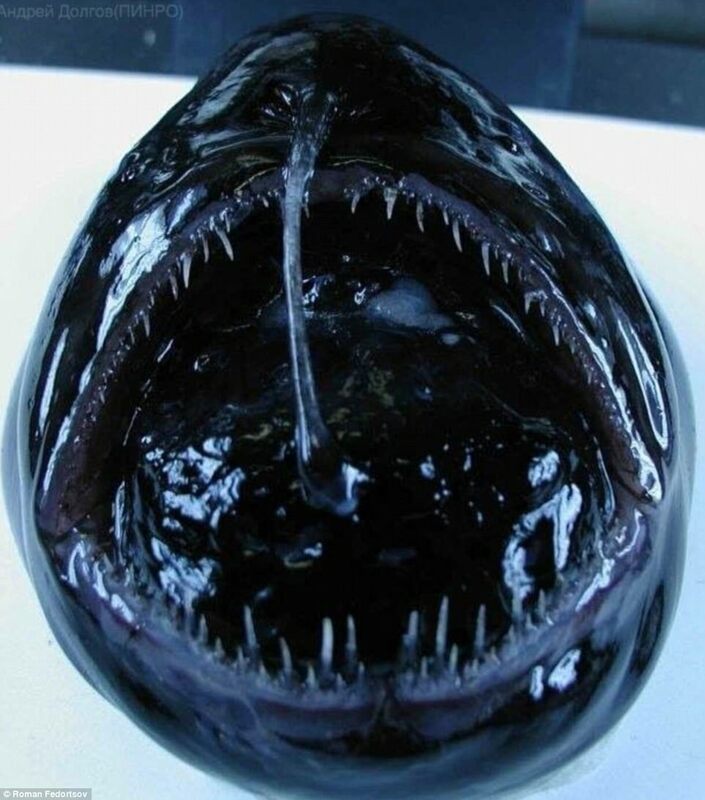 This is the area between 660 to 3,300 feet (200 to 1,000 metres) below the surface which is known as the Mesopelagic zone. Below this is the zone of complete darkness called the bathyal zone, spanning 2,200 to 13,000 feet (1,000 to 4,000 metres). 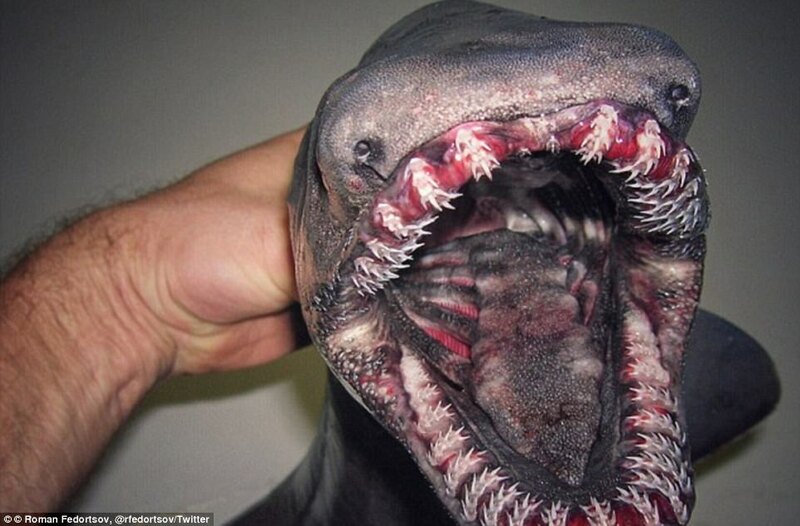 Among the many creatures brought to light is the frilled shark – an elusive eel-like shark with rows of terrifying teeth. 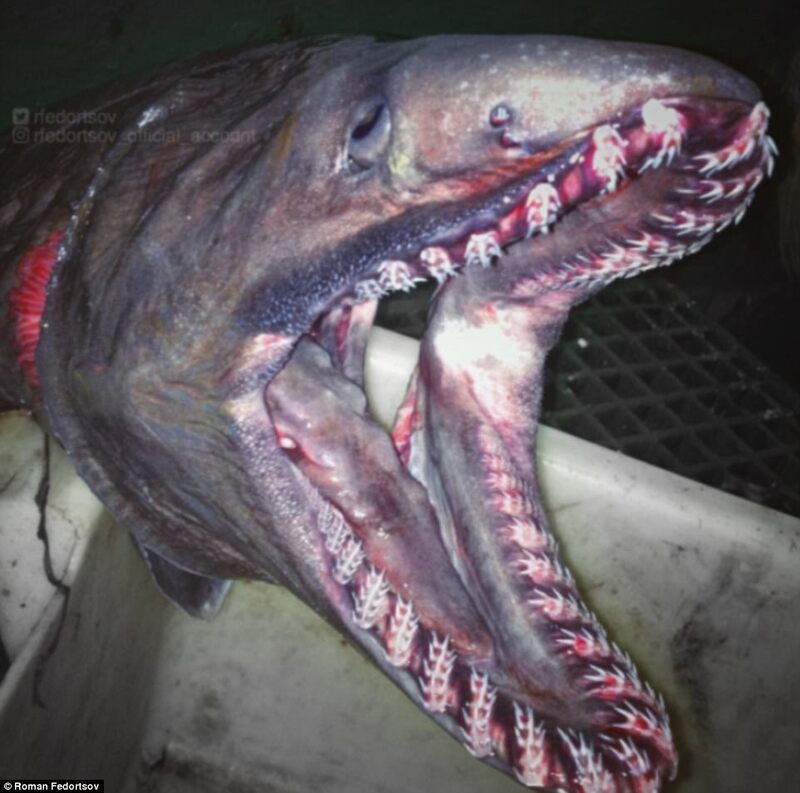 The frilled shark is often called a living 'relic' due to its primitive features. 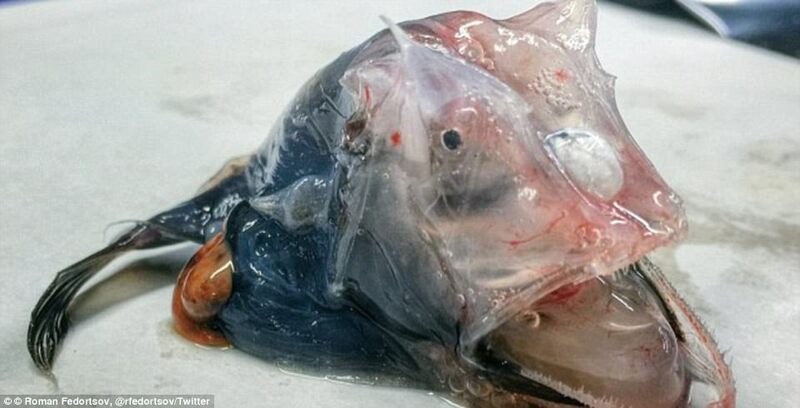 He also tweeted an image of a wolf fish and a bearded sea devil - one of the world's most rarely seen fish. 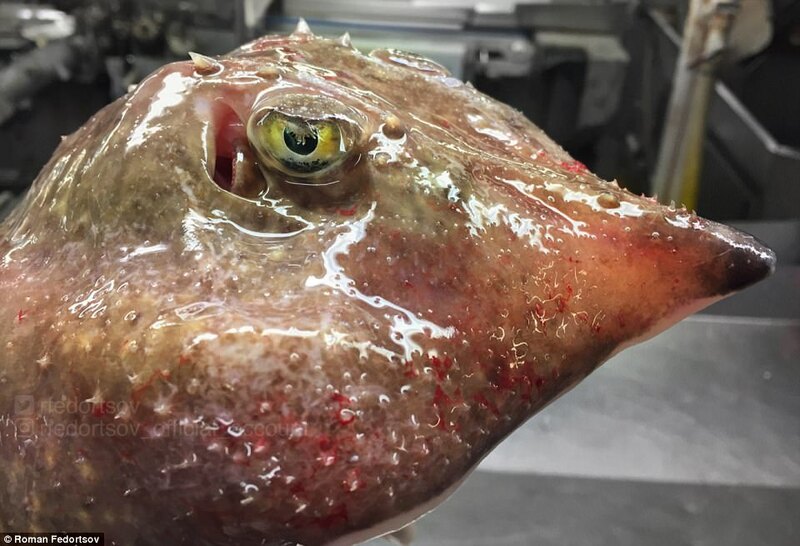 He found a longhorn cowfish, recognisable by its long horns that protrude from the front of its head and a cookiecutter shark, which is part of the 'sleeper shark' family. 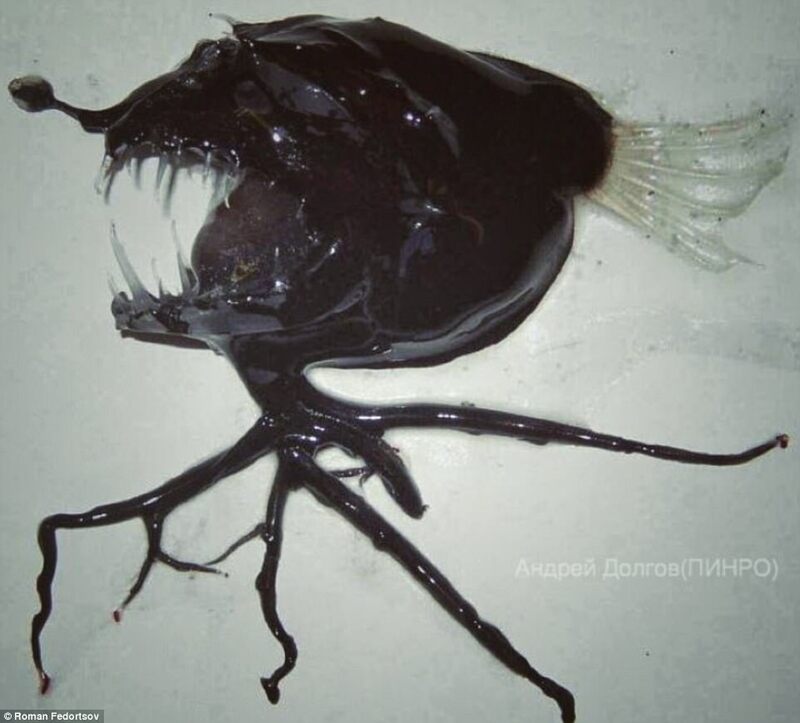 Another strange creature was identified as an Angler fish. 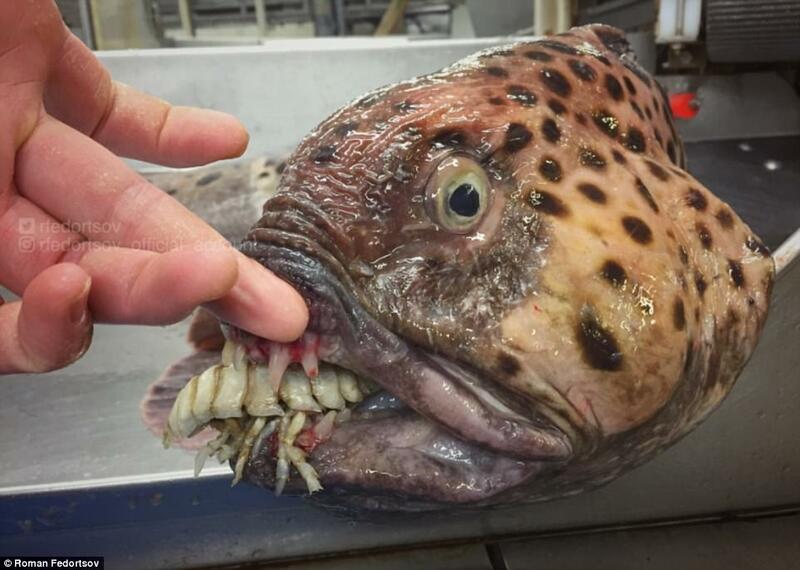 An odd fleshy protrusion coming from the fish's head acts as a lure for prey. 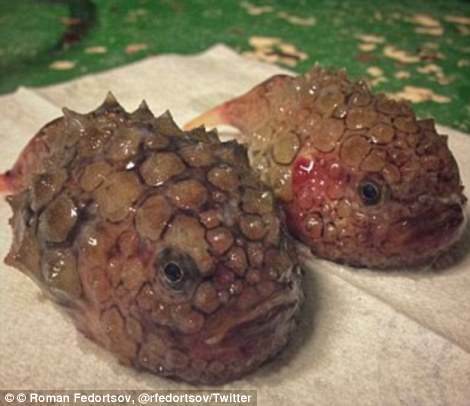 These incredible creatures live in the 'twilight zone' of the ocean. However, some of the stranger creatures stumped even Mr Fedortsov. 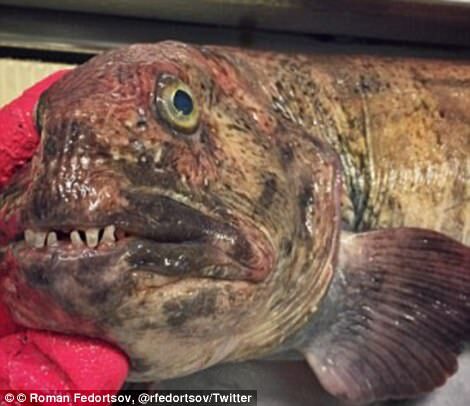 Mr Fedortsov works on a trawler and began sharing his remarkable finds in 2016, the Moscow Times reports. 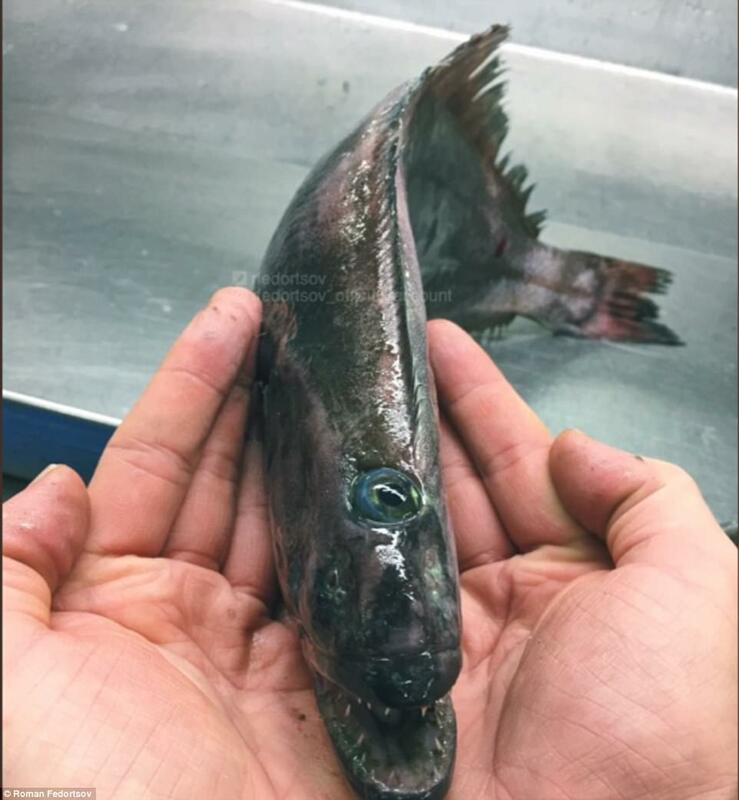 Chimaera are known for their winged fins and long, whip-like tails – and an image captured by Fedortsov reveals their haunting green eyes. But, these glow only when exposed to light. 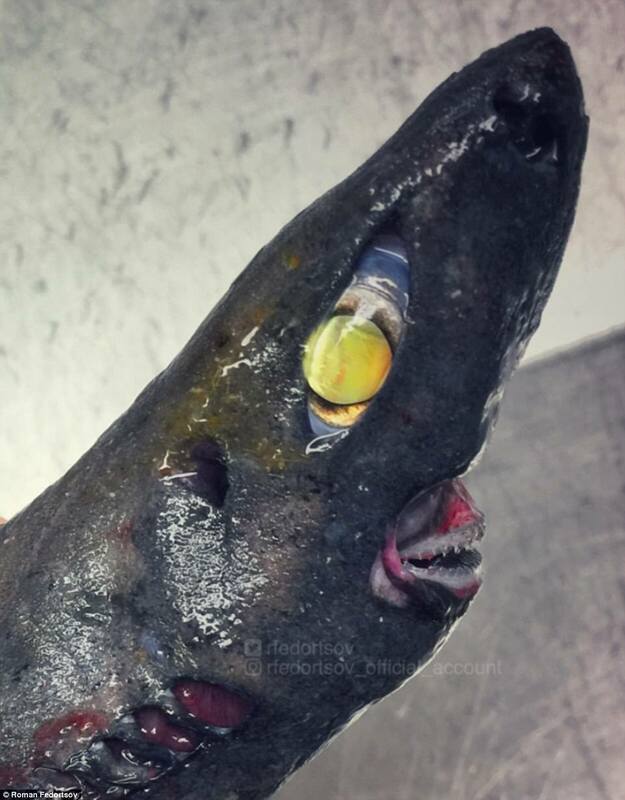 In the darkness of the sea, ghost sharks appear to have sunken, 'dead' eyes. 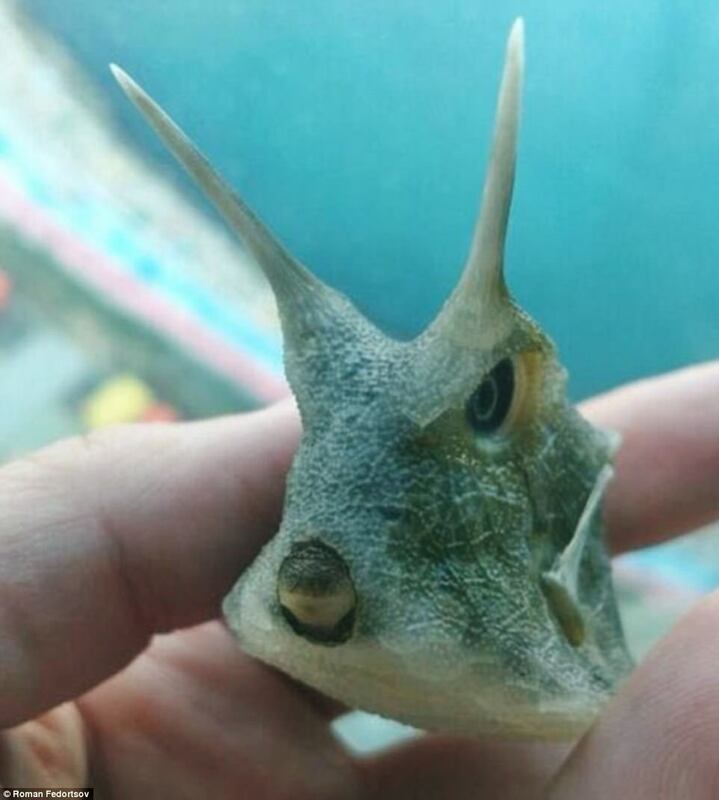 Like sharks and rays, chimaeras have a skeleton made of cartilage. While he may be better versed in deep sea creatures than most people, some catches had even Fedortsov stumped. 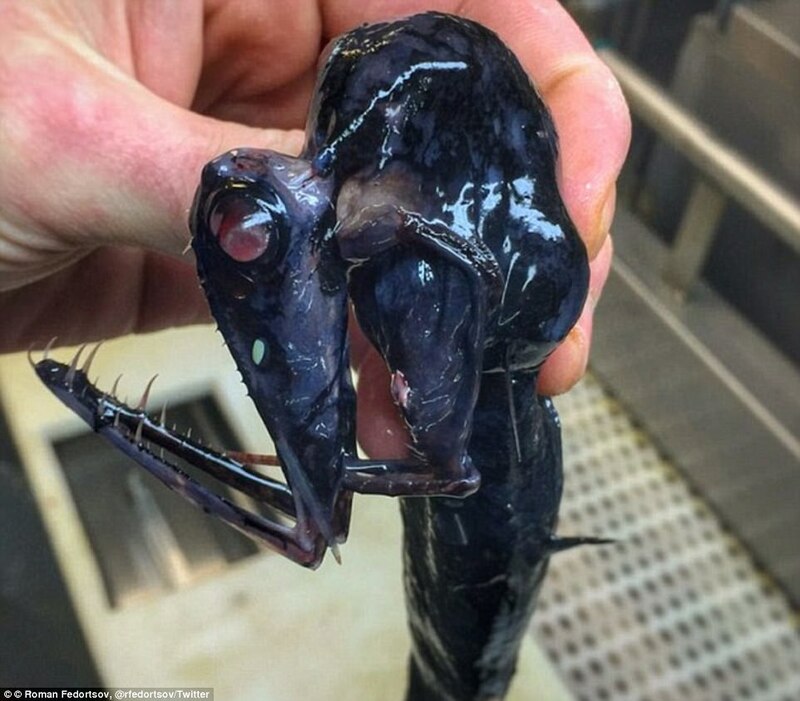 On Twitter, many have chimed in with their thoughts, with some arguing that the specimen in question is a stoplight loosejaw, a deep-sea dragonfish from the genus Malacosteus. 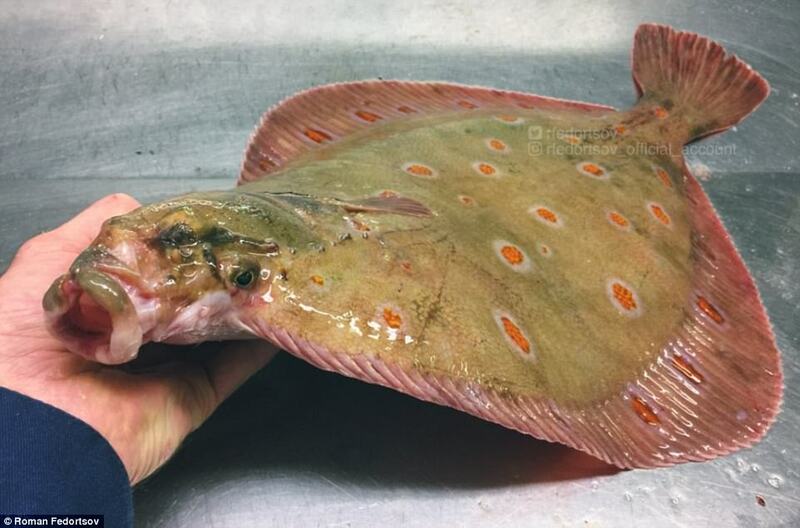 And, not all of the catches are fish. 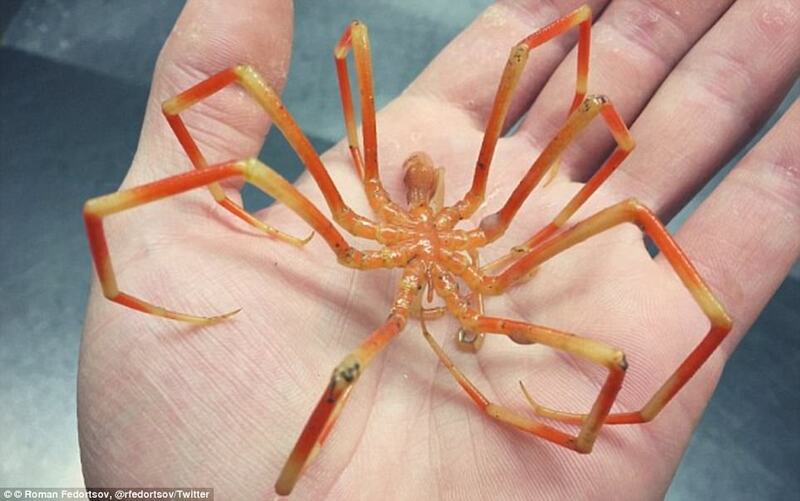 One picture reveals a massive orange 'sea spider' – a marine arthropod with long, spindly legs that's roughly the size of a human hand. 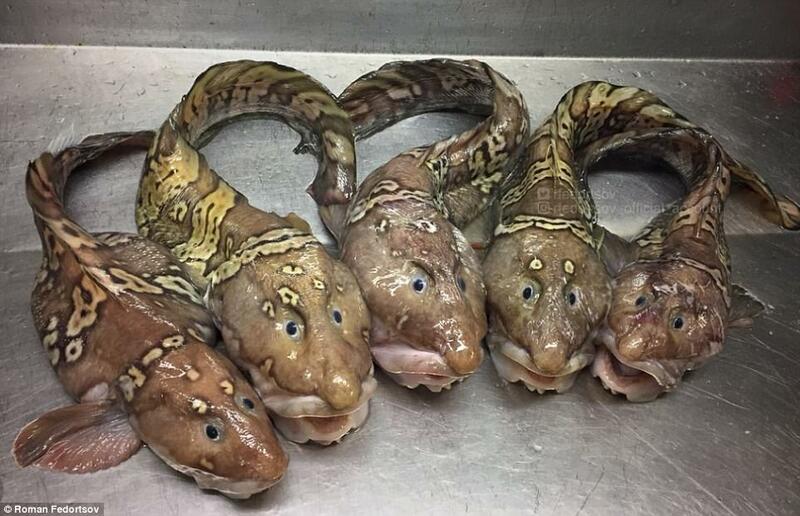 Creatures of a similar appearance were recently discovered in the Arctic and Southern Oceans, where they've been observed at a staggering leg-span of nearly 25 centimetres. 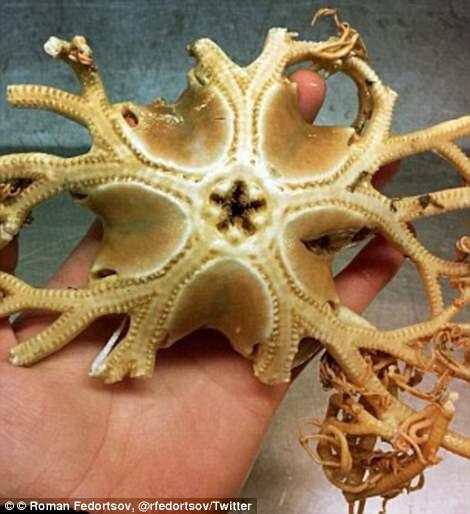 These sea 'spiders' are actually pycnogonids, a type of primitive marine arthropod, and they grow to massive sizes in a phenomenon known as polar gigantism — but scientists don't know why. 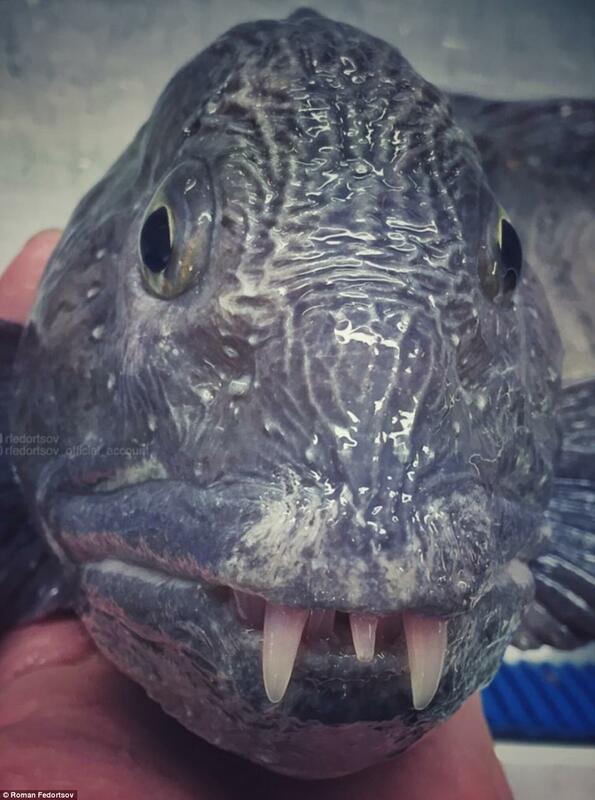 A terrifying fish with massive teeth is also among the many remarkable catches. 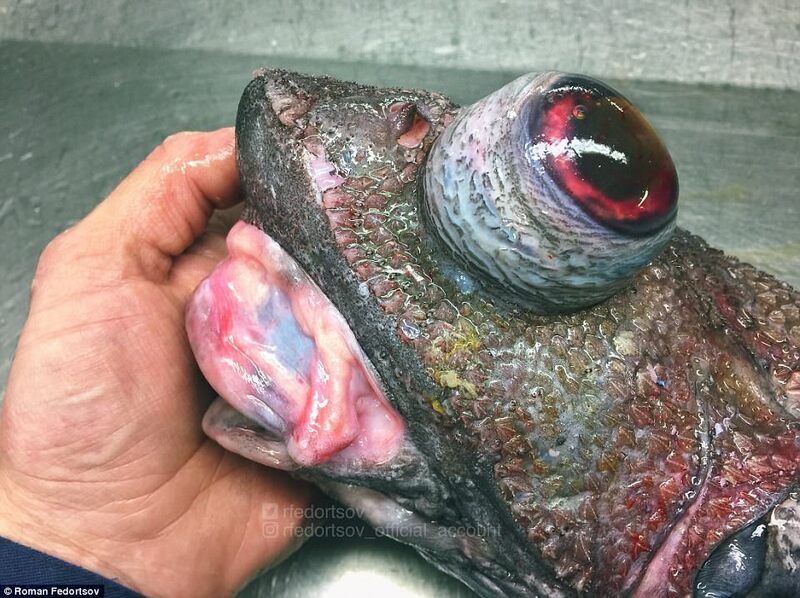 According to Fedortsov, the creature is a black scabbardfish. 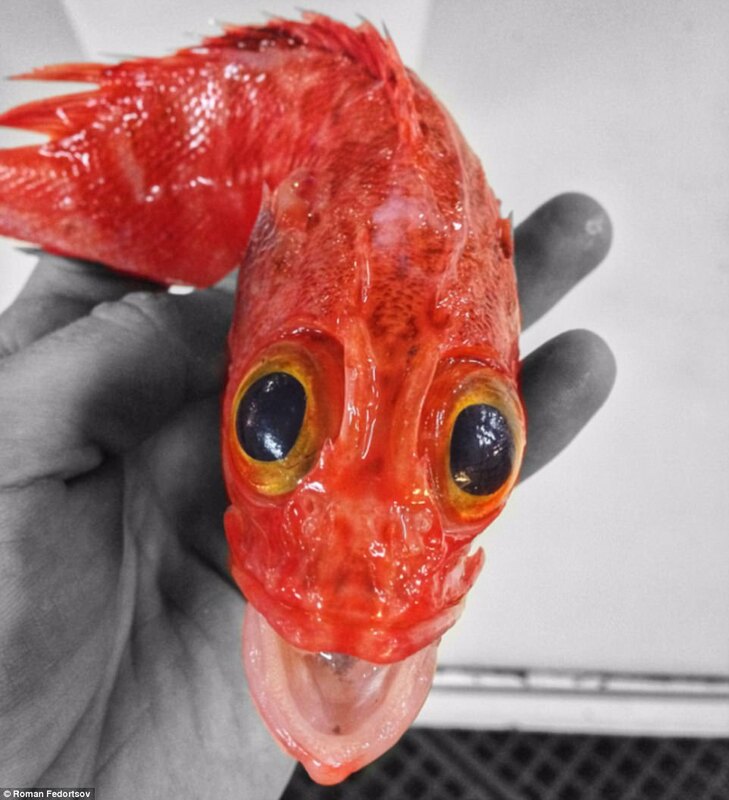 Another bizarre fish, with bulging red eyes and drooping red lips, was identified as a type of grenadier. These are also known as rattails, and can be found deep below the surface from the Arctic to the Antarctic. 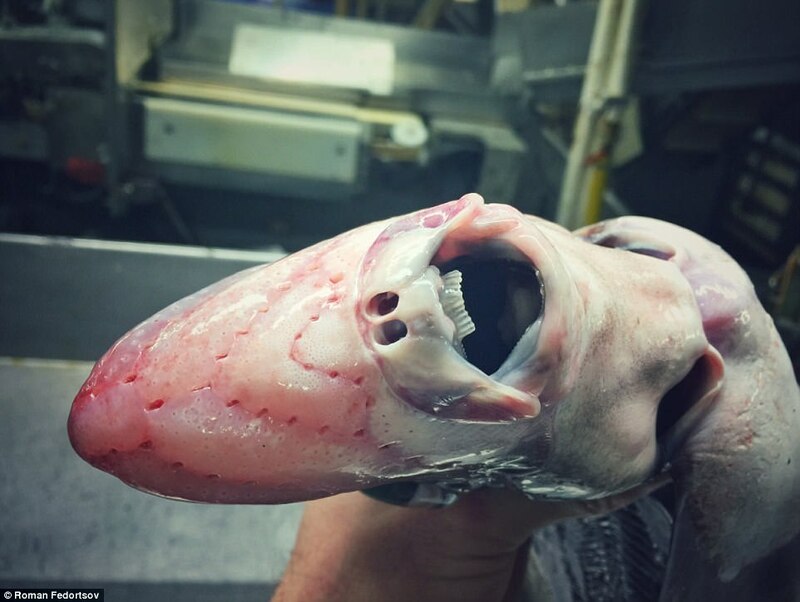 While deep-sea creatures tend to have an alien-like appearance to begin with, it's also known that changes in pressure can affect the appearance of some when they're brought to the surface. 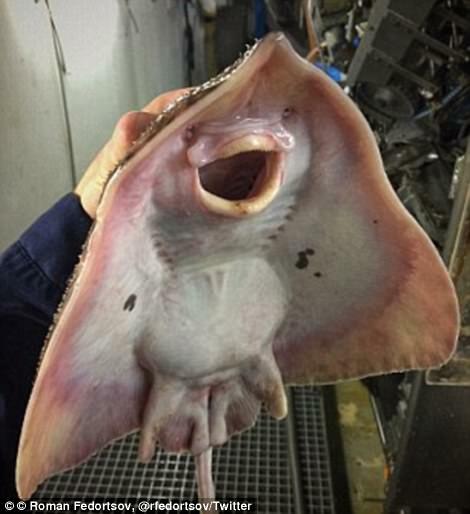 Thousands of feet below the sea, they are subjected to extremely high pressures. While some are able to withstand dramatic vertical migrations, the lower pressures of the world above are known to cause metabolic problems for others, and can even alter their shape.